Thousands of protesters massed at the Japanese embassy in Beijing on Saturday, hurling rocks and bottles at the building and burning Japanese flags. The demonstrators demanded that Japan drop its claim to disputed islands in the South China Sea. ­The dispute worsened earlier this week when Japan announced plans to purchase the islands from their private owners. Japan will buy three of the uninhabited islands from a Japanese family it recognizes as the land's rightful owner, Chief Cabinet Secretary Osamu Fujimura said. China does not recognize Japan's claim to the isles, known to the Japanese and Senkaku and as Diaoyu to the Chinese. Taiwan has also claimed ownership of the territory. ­The sale is worth a reported 2.05 billion yen ($26 million US). 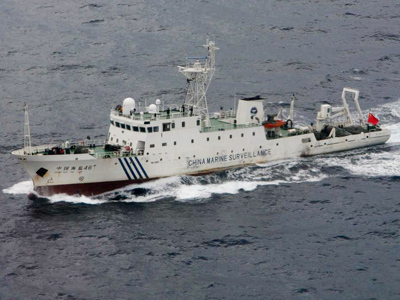 The Japanese Coast Guard will maintain administrative control over the archipelago, which is located amid an important shipping lane and is believed to be sitting on deposits of valuable resources. China responded to Japan's announcement by claiming that it will “never yield an inch” of the islands. ­During the Saturday rally in Beijing, one of the protesters held up a sign with the provocative slogan, "For the respect of the motherland, we must go to war with Japan," Reuters reported. Riot police attempted to use shield and batons to push back the crowd as they waved flags and chanted slogans. Japan's foreign minister was reportedly forced to cut short his visit to Australia and head back to Tokyo to resolve the situation. 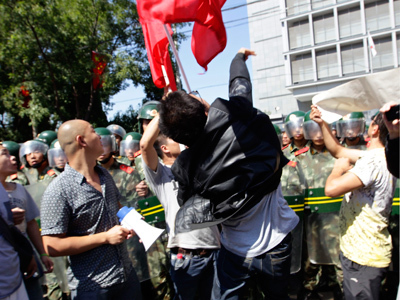 Protests were reported in at least a dozen other Chinese cities, with scattered reports of violence. Hundreds of police were deployed during a demonstration at Shanghai's Japanese consulate. 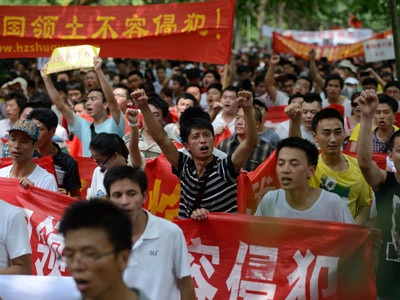 Larrge anti-Japan protests were held in China’s Xian, Suzhou, Changsha and Nanjing provinces, Japanese media reported. Tensions between the two countries intensified on Friday when six Chinese ships entered Japanese waters near the disputed islets, ignoring the Japanese Coast Guard's orders to leave. 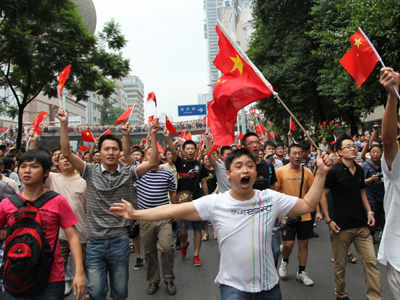 For the past week, sporadic protests took place across China, and overseas. Some 200 members of Greece's Chinese community gathered outside the Japanese embassy on Friday raising banners and placards in Chinese, English and Greek saying, "Chinese expats in Greece firmly oppose Japanese occupation to Chinese territory Diaoyu Islands." The rally ended peacefully.